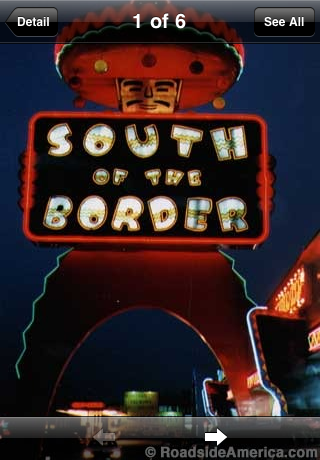 RoadsideAmerica.com, the online guide to offbeat tourist attractions, announced the recent launch of its Roadside America mobile software app for iPhone and iPod touch. Roadside America showcases thousands of eccentric, entertaining, and unique roadside tourist spots found around the country. "The app makes it easy for travelers to instantly see what's nearby," said Doug Kirby, publisher of RoadsideAmerica.com. "It's up to them whether to veer off to see a mustard museum or a colossal hot dog." The app features road trip favorites such as giant twine balls, tiny churches, odd statues, quirky museums, implausible architecture, classic Rte. 66-type attractions, folk art environments, mystery spots, gravity hills, caves, and much more. "It's the trip tool we've always wanted for our own use," said Kirby, who has visited thousands of attractions as part of the RoadsideAmerica.com team. "After years of navigating with map in lap, this finally connects our collection of places in a practical way, using the latest mobile and geo-location smarts." With the Roadside America app, users can access attraction stories, visitor tips, maps, driving directions, hours, phone numbers, and photos. The app can retrieve real-time updates and attraction status reports from RoadsideAmerica.com. "We designed the app to be fun -- and a little offbeat, naturally," Kirby said. Among its exclusive on-the-road trip tools: it can warn when sunset approaches, or schedule a phone alert to get a sidetracked tourist back on the road. And there are many app-only photos and promising places "under investigation" and not yet on the website. Users can browse attractions by over 70 Roadside-centric themes, such as "Big," "Atomic," "Music," "Tech," and "Zombie Army." They can share discoveries via social networking sites such as Facebook and Twitter, or snap photos for submission directly to RoadsideAmerica.com. For lifelong road trip enthusiasts, the app's "Been There!" feature is a way to keep track of roadside attractions they have visited. Roadside America is available on the Apple (U.S.) App Store for $2.99 for permanent access to any one of six U.S. regions; an additional $5.99 unlocks the entire U.S. for one year. is there an app for this idea for a smart­phone that is NOT an Iphone or Ipad,..?